Muhammad Ali called himself The Greatest and the King of the World. The three-time heavyweight champion of the world was one of the most famous men on the planet. But he always seemed most comfortable in the streets. Today, the streets returned the love. Tens of thousands of Louisville, Kentucky, residents came out to say goodbye to Ali, who died last week at age 74. But there was little mourning and no formality. Instead, the city celebrated the unlikely life of a native son who rose from the repression of Jim Crow segregation to make his name as perhaps the greatest boxer of all time, and to cement his legacy as an inspiring symbol of courage and self-determination. People lined the streets and cheered as Ali’s 17-car funeral procession took a final tour of his hometown. It made its way past his downtown museum, his high school, the gym where he learned how to fight, and through the ramshackle streets of his old neighborhood in the predominantly black West End. As the line of cars moved slowly along Muhammad Ali Boulevard, people did not hold back. Spontaneous chants rose like they used to when The Champ entered the ring. “Ali! Ali! Ali!” they screamed. They snapped photos. They raised clenched fists. One man could be seen wearing red boxing gloves and doing a little shuffle as the procession approached. When the hearse carrying Ali’s body rolled by, people felt comfortable approaching, just as they used to when they saw him walking down the street. They ran to place flowers on the car. They felt free to run up to the long limousines that trailed Ali’s hearse to shake hands with family members, friends and celebrities. And the people in the limos kept their windows down to encourage the fun. It was a fitting tribute for a man who was bigger than any superstar, and yet was always accessible to everyday people. Brown was among maybe a dozen members of Guiding Star Baptist Church who camped out early on folding chairs in front of their church, waiting to catch a glimpse of the funeral procession. Several dozen people stood in clusters along the residential street. A U.S. flag in the front yard of one home flew at half-staff. No one seemed to mind as the sun heated the day toward 90 degrees and people learned that the motorcade was maybe an hour behind schedule. Instead, they traded stories about Ali’s courage and his connection to everyday people. 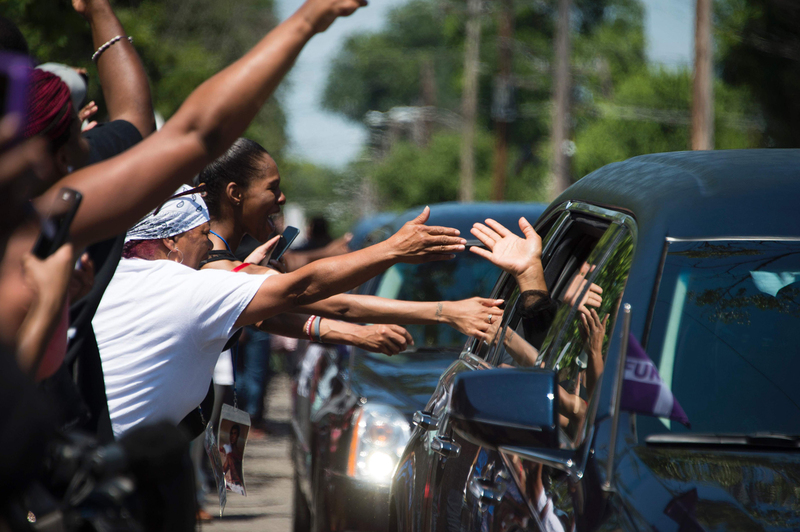 People reach out to the limousines in boxing legend Muhammad Ali’s procession as it drives past his childhood home where mourners waited to pay their respects on June 10, 2016 in Louisville, Kentucky. Thousands of people from near and far were expected to line the streets of Muhammad Ali’s hometown Louisville on Friday to say goodbye to the boxing legend and civil rights hero, who mesmerized the world with his dazzling skills. Melissa Williams, a member of the church, whipped out a smartphone to share a couple of pictures of Ali chatting with a woman who volunteered as a foster grandmother in a program she used to run. Brown talked about photos he had seen of Ali playing Monopoly with his friends in their Louisville homes long after he became famous. Other members of the church group remembered and admired Ali’s courage. Joyce Holliman, 63, is a retired teacher who moved to Louisville after being raised in Philadelphia, Mississippi, the town where three civil rights workers were murdered in 1964. That was the same year that Ali won the heavyweight championship and joined the Nation of Islam, telling white America — and everyone else — he did not care what they thought. A family spokesman said Ali helped plan the procession and every other part of his farewell, and it reflected the fullness of his life and bore his mark. His memorial service and the events that accompanied it brought legendary athletes, movie stars, diplomats and presidents to Louisville. His life is being feted by imams and rabbis, Mormons and Christians. Yet, everyday people were at the heart of the celebration. He insisted that he have a public memorial service, and the 15,000 tickets that were given away for the ceremony at the KFC Yum! Center were snapped up within hours. Ali’s funeral procession ended at Cave Hill Cemetery on the east side, where he was buried. Tabasum Hussain, found herself outside the locked cemetery gates Thursday evening. Hoping to attend Ali’s memorial service, she, her husband, Sadat, and 8-year-old son Yasin, had driven 12 hours from Toronto. But when they arrived in Louisville, they learned that the tickets were gone. “I was gutted,” Hussain said. So she and her family found themselves peering through the fence trying to get a glimpse of Ali’s final resting place. After the procession passed by, the Guiding Star Baptists packed up their chairs and prepared to head back to their lives. Some headed home, others were going to work. They are regular people, leading regular lives. Ali never led a regular life, but he felt at home with those who did and they returned the sentiment.